I'm reading this fascinating book at the moment, loaned to me by my friend Lisa. The author took nine gems, in order from softest to hardest, starting with Amber and ending with Diamond of course, and travelled around the world to discover their origins, history, mythology, and the people who mine and trade them today. It's enough to make a jeweller very uncomfortable- Australia comes off pretty well in her exploration of the opal mines of Queensland- but gem mining in some developing countries can be an ethical and environmental nightmare. 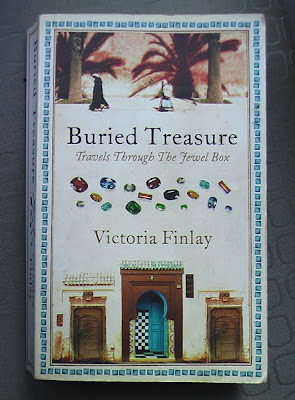 One of the most interesting things to me in this book is the stories of mad-professor-types who create precious stones in their laboratories- emeralds, rubies, opals made in jam jars in the outback, even diamonds made from the cremated remains of your loved ones. As an unbearable snob, I've always turned up my nose at lab-created stones. This book made me question the value of minerals pulled out of the ground, however, and will make me look again at man-made precious gems. Sounds interesting. Everything is an eye-opener once you trace the chain of supply, especially where human exploitation is involved. I also thought that only things like cubic zirconia were man made so that is something I just learnt from you.